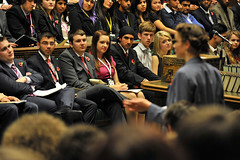 Image © [caption id="" align="alignleft" width="240" caption="The UK Youth Parliament listen to speeches - image from the UK Parliament photostream"] [/caption] The increasing cost of a university education and rising youth unemployment have caused more young people to take an interest in politics, but many young people do not trust the three main parties or mainstream politics in general. There are several possible reasons for this. Firstly, there is resentment over the perception that politicians had opportunities in their youth which are unavailable to today's young people. Many MPs are baby boomers who benefitted from a free university education, a buoyant job market and unprecedented social mobility. The coalition’s unpopular education policies (the dramatic rise in tuition fees, the cuts to higher education and the scrapping of the Education Maintenance Allowance), combined with the lack of employment opportunities, seem to be sending a message from politicians that ‘we benefitted from free education, good jobs, and the ability to rise up the social ladder, but we won't let you have any of these things’. Secondly, the great scandals of recent times (the financial crisis, the expenses scandal and phone hacking) have only heightened the level of cynicism surrounding mainstream politicians. In particular, the expenses scandal seemed to offer strong evidence for the view that MPs only go into politics for their own benefit, not to serve their constituents. Thirdly, the record of broken promises (in particular, the Lib Dem U-turn on tuition fees) means that many young people will remain cynical even if MPs do try to engage with their concerns. Perhaps one way for the main parties to engage with young people is to connect with movements in society in which young people are involved. In Labour’s case, the party could connect with the extra-parliamentary movements on the left (such as the student movement, UK Uncut and the SlutWalk) and give them a voice inside parliament. Whether Ed Miliband will decide to do this is still uncertain. The Tories and Lib Dems have been the targets of much of the recent protests, so this approach will not work for them. But David Cameron’s idea of the Big Society emphasizes the importance of charities and voluntary work, so perhaps the Conservatives could forge greater links with charities in which young people are involved, as well as charities which help young people in difficulty. However, this could expose the Tories to the criticism that, if the government was doing more to provide education and employment opportunities for vulnerable young people, there would be less of a need for the charity sector to pick up the pieces. Gaining the trust of young people will be most difficult for the Lib Dems: their spectacular volte-face on tuition fees means that they have probably lost the youth and student votes for a generation. So we are left with a situation in which all three main parties are either unable to engage with young people, or unwilling to do so, because they believe the political risks are too great. Perhaps this situation will only change when organisations in civil society which include young people are strong enough to pressurize political parties into taking account of their concerns. How can the main parties gain the trust of young people? The increasing cost of a university education and rising youth unemployment have caused more young people to take an interest in politics, but many young people do not trust the three main parties or mainstream politics in general. There are several possible reasons for this. Firstly, there is resentment over the perception that politicians had opportunities in their youth which are unavailable to today’s young people. Many MPs are baby boomers who benefitted from a free university education, a buoyant job market and unprecedented social mobility. The coalition’s unpopular education policies (the dramatic rise in tuition fees, the cuts to higher education and the scrapping of the Education Maintenance Allowance), combined with the lack of employment opportunities, seem to be sending a message from politicians that ‘we benefitted from free education, good jobs, and the ability to rise up the social ladder, but we won’t let you have any of these things’. Secondly, the great scandals of recent times (the financial crisis, the expenses scandal and phone hacking) have only heightened the level of cynicism surrounding mainstream politicians. In particular, the expenses scandal seemed to offer strong evidence for the view that MPs only go into politics for their own benefit, not to serve their constituents. Thirdly, the record of broken promises (in particular, the Lib Dem U-turn on tuition fees) means that many young people will remain cynical even if MPs do try to engage with their concerns. Perhaps one way for the main parties to engage with young people is to connect with movements in society in which young people are involved. In Labour’s case, the party could connect with the extra-parliamentary movements on the left (such as the student movement, UK Uncut and the SlutWalk) and give them a voice inside parliament. Whether Ed Miliband will decide to do this is still uncertain. The Tories and Lib Dems have been the targets of much of the recent protests, so this approach will not work for them. But David Cameron’s idea of the Big Society emphasizes the importance of charities and voluntary work, so perhaps the Conservatives could forge greater links with charities in which young people are involved, as well as charities which help young people in difficulty. However, this could expose the Tories to the criticism that, if the government was doing more to provide education and employment opportunities for vulnerable young people, there would be less of a need for the charity sector to pick up the pieces. Gaining the trust of young people will be most difficult for the Lib Dems: their spectacular volte-face on tuition fees means that they have probably lost the youth and student votes for a generation. So we are left with a situation in which all three main parties are either unable to engage with young people, or unwilling to do so, because they believe the political risks are too great. Perhaps this situation will only change when organisations in civil society which include young people are strong enough to pressurize political parties into taking account of their concerns.